Looking back on the context of a band which is definitely more pop than anything else (and lacking a significant number of members), Pretty. Odd. may leave listeners of the more recent Panic! At The Disco albums slightly confused. In fact, it left listeners of the band’s debut confused as well. Panic! At The Disco was set to be a key player in the so-called emo scene alongside bands such as Fall Out Boy and My Chemical Romance. This idea came crashing down as the opening track on the sophomore album, which turns 11 this year, rang out. Indeed, this track, ‘We’re So Starving’, borders on amusing for this reason. The lyrics contain a suspiciously specific denial from the band that “you don’t have to worry ‘cause we’re still the same band” before proceeding with a folksy, Beatles-esque album. The strange lyrics and titles often cause fans to mention the involvement of drugs in the creation of Pretty. Odd. ; key amongst these is the song ‘That Green Gentleman’, which tries to convince its stereotypically angsty listeners that “things have changed for me, and that’s okay” to a somewhat frosty reception, the title of which is often linked to marijuana. The secret behind this album, however, is that it’s actually a solid display of what the band is capable of. Whilst its predecessor A Fever You Can’t Sweat Out is unique and verbose, and its successor Vices & Virtues is effective as what is essentially a reboot for the band following its split in 2009, Pretty. Odd. is quite a lovely thing to listen to, particularly for those preferring a more gentle sound. 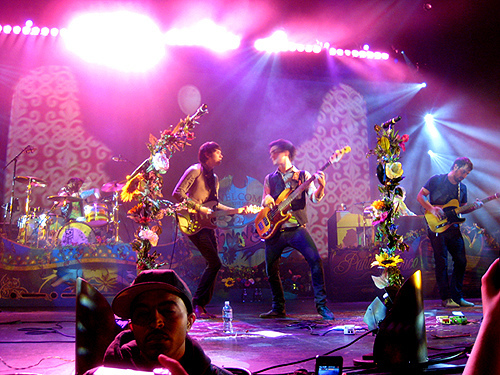 Even those who hated the new music at the time tended to admit a soft spot for the solemn seventh track, ‘Northern Downpour’, and it remains a solid fan favourite. Fans tend to look back to Pretty. Odd. now with a sense of nostalgia. It’s often cited as the favourite album of those considered the true die-hards, though this is frequently attributed to the involvement of Ryan Ross, the band’s then-guitarist, main songwriter, and occasional singer. Ross wrote the majority of both of Panic!’s first two albums, then departed from the band along with bassist Jon Walker, leading to yet another change in sound as Brendon Urie took over much of the writing. Admittedly, Ross’ singing wasn’t the best in terms of technical ability, but his vocals definitely added to the folksy effect of the songs on which they were prominent; indeed, the band he and Walker formed together following the split, The Young Veins, displays the direction in which Panic! At The Disco could easily have gone after the release of Pretty. Odd. Now, however, although the album is more popular with the fans, it seems to be something of an energy drain (at least in terms of performance) for Brendon Urie, the only remaining original member of the band. The only song still played at live shows from Pretty. Odd. is ‘Nine In The Afternoon’, to which Urie attributes the slower nature of many of the other songs. Admittedly, as the Panic! discography grows, it makes sense to have fewer songs per album anyway; the band has nearing 100 songs, and to have a concert with all of them would last around 5 hours. Either way, Pretty. Odd. remains an album which is in a strange limbo where it’s both loved and hated. But, for those seeking a Beetles-y vibe and psychedelic lyrics, it’s definitely worth a look.